When you choose which plants to grow on your homestead, you likely focus on the ones that provide food for you, your family, or your animals. You might also grow plants for other harvests such as firewood. While you may not mind native plants, you probably aren’t focused on adding them to your homestead. What if I told you that adding native plants to your homestead would not only increase your own harvests, but also enhance the overall wild abundance on your homestead? Keep reading to find out how. Native plants or non-native? What do you do with weeds? Reading various blogs, listening to podcasts, or watching YouTube videos, it often seems like there are 2 camps—those who focus on native plants exclusively, and those who don’t think we should be worrying about the distinction at all. But I think this debate misses the point. 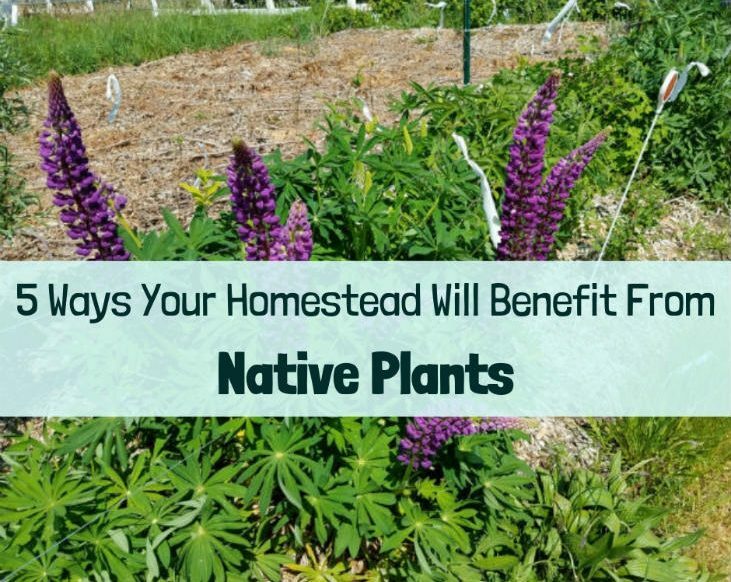 Yes, there are great reasons to plant non-native plants on your homestead. But native plants have a value all their own that simply can’t be replicated by plant life that’s not native to your area. And they shouldn’t just be limited to the edges of your homestead; they should be integrated all throughout your homestead—among fruit trees, in the vegetable garden, and in your flower beds. If you work with nature, nature works with you. Native plants provide direct benefits to your homestead that can be broken down into 5 key areas. Some of these benefits can be provided by non-native plants, but the advantage of native plants is that with some careful selection, native plants can provide all 5 benefits at once. Of course, I know that one of the biggest challenges with planting more native plants is that you may not know much about the native plants that grow in your area. To help with this, I’ve made a free and easy-to-print cheat-sheet that lists resources to get you started with native plants and summarizes this post. Sign up to get your cheat-sheet, so you can start benefiting from native plants. My day job as a restoration project manager has taught me a lot about native plants. These plants can provide many benefits to your homestead and to your gardens if you learn to include them in your planting plans. Before covering the 5 benefits of native plants, I should clarify what I mean by native plants. Native plants are usually defined as the plants that grew in a given location before human intervention. But going back to the last ice age or even earlier does not make much sense. The world was a little different back then. So often the date chosen is right before western settlement—at least in the Americas. But this ignores the fact that the land was heavily influenced and cultivated by the indigenous communities whose nations already lived in these lands. Okay… but where does that leave us for defining native plants? A native plant is a plant that has adapted to live with the other plants and animals that make up the community of life it is found in. This means that there will be certain animals that depend on that plant to survive. The monarch butterfly, with its dependence on milkweed for reproduction, is a classic example of this. But the trait is actually much more common among plant-eating insects. This definition is critical to understanding native plants and the benefits they bestow on the ecosystems in which they’re uniquely suited to exist. These native lupines support 64 different species of moths and butterflies. By planting native lupines and many other native plants my homestead is support a wide range of insect life. More insects? Why, you might be asking, would I want more insects? Most insects won’t damage your crops or cause you any problems. In fact many of them are actually beneficial and can help reduce pest problems. It turns out that most plant-eating insects are “specialists,” meaning that they only eat 1 or 2 specific native plants. Remember the monarch butterfly that we all love? It is not unique in its picky ways. In the book Bringing Nature Home, by Douglas Tallamy, Tallamy writes about research that shows that roughly 90% of plant-eating insects rely on a few specific native plants. These picky eaters won’t bother your crops, but they will help support all the predators that will eat not just them, but also the less picky insects that go after your crops. But more on that in the next section. Across the world it seems that insects are dying. You may have heard about honey bees and colony collapse but the impact is much larger than the bees. As a kid I remember the car windshield getting covered in dead bugs during cross-country road trips but today that just does not happen. Have you noticed a drop in bugs in your area? The Insect Apocalypse Is Here - What does it mean for the rest of life on Earth? Native plants can be planted next to non-native plants. This hedgerow on my homestead is filled with native and non-native plants creating a diverse and abundant environment. Planting native plants on your homestead increases your biodiversity in 2 big ways. The first is that by simply planting the native plants, you’re probably increasing the diversity of plants on your homestead. Imagine taking a traditional garden and adding some edible native crops to it. Chances are your garden will be one of only a few in your community with those native crops. This increases the biodiversity of your garden, which can help reduce pest issues. Native plants also increase the diversity of life in another way. Remember all those picky insects that only eat a couple specific types of native plants? Well, those plant-eating insects make up almost a third of all animal life. Insects are so tiny that we hardly think of them when we picture animal life. But their collective impact (power in numbers!) is huge, especially when it comes to the picky eaters. So what happens when they go away? Imagine removing 33% of all animal life. You better believe that would have an impact on other wildlife in your area. The easiest way to understand the impact is with birds. It turns out that almost all (96% according to Tallamy’s book) song birds feed their young mostly insects. Remove all those picky insects and you lose out on a major food supply for all those hungry peeping baby birds. That doesn’t bode well for the bird population on your homestead. But it can work the other way, too. By planting a diversity of native plants your homestead, you can support more of those picky insects. This will feed more birds, which will in turn support other wildlife, which will add much more life to your homestead. A diverse abundance of life on your homestead is more likely to result in a homestead in balance with nature. You might even call it a Wild Homestead. Native plants help connect your homestead to the natural environment around it. I volunteer with a local non-profit to salvage native plants from development sites. This allows me to get free native plants to add to my homestead. Often, I see plants recommended to homesteaders based on their climate. This means a homestead where I live in western Washington state and a homestead in, say, England could end up looking about the same and having mostly the same plants. As much as I love England, (I lived there for a year,) I want my homestead to feel like it’s truly a part of western Washington—not England. While my food crops may be the same, the flowers and supporting plants don’t need to be. Sword ferns are very common here in western Washington. You can’t really picture a forest here without picturing sword ferns. I remember the first time I planted sword ferns near my house. It just made my homestead feel like it belonged—it felt like an extension of the forest across the street. Over time, I’ve added more native plants, and now my homestead really feels like it fits with the land around it. We can bring the wild back to our homesteads instead of pushing it further away. This may seem like a minor benefit, but I truly believe that in our modern world, many of us have lost our sense of place. Part of the appeal of homesteading to me is reconnecting with the land. But can you truly do that if your homestead looks the same as any other temperate homestead? Native plants can connect your homestead to the land around it, giving you a true sense of place. Native plants don’t just support wildlife—they can support you and your family by providing an easy, low-maintenance harvest. Before our diets became roughly uniform, people ate food that was truly local. The food that naturally grew in their area. This included cultivated food, but also food from foraging. It’s harder to get more local than food foraged from the land around you. Luckily, you can plant native edible plants, so you don’t have to rely on foraging wild areas. There is no way I can provide a list of native edible plants for every place, but a quick google search should come up with lists for your area. And native edibles often go beyond the berries you may love to eat. Native edibles can replace or supplement traditional staple crops like potatoes. For example, in my area there are two native plants that can replace more traditional staple crops like potatoes—Camas and Wapato. Camas is a prairie flower that produces a starchy bulb that can be slow-cooked until the starch turns to sugars, making a great staple food source. Wapato is a wetland plant that produces tubers that can be cooked like a potato. It’s so similar to a potato that you can even make “potato” chips with it (Wapato chips?). Of course, native plants can also provide other harvests such as fiber, medicine, or lumber. These plants are often really easy to grow, since they’re already tailor-made for your unique climate and weather conditions. You shouldn’t need to water the plants that have been growing in your neck of the woods since before the advent of the backyard sprinkler. Just sit back, relax, and let nature do most of the work. I have planted multiple species of native lupines all over my homestead to support my other plants. This last benefit is not unique to native plants—it is common to grow plants that support other plant life, such as those that fix nitrogen, like legumes. But it often seems like native plants, when they’re sought after at all, are relegated to the fringes instead of being grown as support plants for crops. There really is no reason for this. Sure, some native plants can be aggressive and act like a weed, but so can non-native plants. You just need to pick the right plants in either case. I’ve been planting native lupines on my homestead. Lupines fix nitrogen, which helps my other plants grow. They get beautiful flowers that support our local pollinators, they can be chopped-and-dropped to provide mulch, and they support 64 species of butterflies and moths. The caterpillars of many of these are picky eaters that wouldn’t have much, if anything, else to eat in our area without the lupines. Next time you’re planting a flower bed to support beneficial insects, or planting other support plants, think about using native plants to do the job. You will do so much more good for your homestead than if you went with non-native plants. In front of my house I'm adding native plants and non-native plants. This picture shows a new area planted with native strawberries and several other native plants. Planting more native plants on your homestead will provide you real and direct benefits that will make homesteading easier, not harder. It really comes down to a mindset shift. A lot of times when people talk about adding native plants to their homestead, if it’s on their radar at all, they talk about using the native plants to create a wild space or sanctuary on the fringes of their turf, as a contrast to their landscaped or cultivated areas. Instead, we should be considering native plants for any of our homesteading projects, whether we’re looking for edibles, medicinal plants, soil enhancers, ornamentals, or anything else. In planting decisions, the key is to consider native plants alongside other plant varieties, and to consider the unique characteristics, potential harvests, and other benefits that each plant might bring to your homestead. Since starting my homestead, I’ve planted well over a thousand native trees, shrubs and smaller plants. Every year I add more. The result has been an explosion in wildlife—especially with birds. But as the number of birds increases, I’m actually losing less of my edible berries to them. There is so much other food for the birds that my cherries, for example, just don’t stand out as much to them. My land is moving towards finding its balance—a true Wild Homestead. Yours can too. I know that learning your area’s native plants can seem like a daunting task. That’s why I put together a free and easy-to-print cheat-sheet with some extra resources to help you get started with native plants. Once you have your cheat-sheet, please leave a comment and share, pin, or tweet this post if you liked it. I’d love to hear your thoughts on planting native plants on your homestead.